The 2018 BMW 6-Series includes, convertible and Gran Coupe models spanning a wide range of equipment, features and performance. 640i models are powered by a 3.0L turbocharged inline 6-cylinder engine, making 315 horsepower and 332 pound-feet of torque, while 650i models get a turbocharged 4.4L V8 that produces 445 horsepower. Both offer either a 6-speed manual gearbox or 8-speed Sport Automatic transmission. With either transmission, the 650i can get to 60 mph in 4.8 seconds and to an electronically limited top speed of 155 mph. The Alpina B6 Gran Coupe is only available in one body style and is also powered by a V8, this time with two turbos and producing 540 horsepower and 540 pound-feet of torque. Power is sent to all four wheels through BMW's X-drive system and an 8-speed automatic. M6 models are powered by a similar M Twin Power engine — a twin-turbo V8 that's the same size as that in the 650i and B6 but developing 560 horsepower and 500 pound-feet of torque. It's also paired with a 7-speed M Double Clutch automated gearbox, as well as an Active M Differential and special wheels, brakes and suspension to suit the stronger performance. A 6-speed manual transmission is also available throughout the M6 lineup as a no-cost option; it offers seamless automatic rev-matching for downshifts in Efficient or Sport modes, while Sport+ mode requires the driver to mind his or her own revs. The 6-Series models offer a number of innovative chassis technologies that make them handle like smaller vehicle — responding crisply yet riding smoothly. The standard Dynamic Damper Control works with the double-wishbone front suspension and multi-link rear axle to adapt to different driving surfaces and control body motion, while Active Roll Stabilization further helps keep cornering flat. Integral Active Steering is also on offer, with a steerable rear axle helping make the 6-Series models feel shorter in tight, quick maneuvers. Convertible versions offer a smooth power-operated fabric soft top. Gran Coupe models feature four doors and about 4.4 inches of additional length overall — with most of it going to additional rear legroom. BMW calls the Gran Coupe's seating layout "4+1," referring to the four roomy outboard seats with one much smaller middle position in back. All models feature a driver-oriented cockpit layout, with a swept-across style to the instrument panel and a clean look afforded by BMW's iDrive controller system, which wraps in several ancillary controls that might otherwise have their own separate buttons. A black-panel instrument cluster combines the traditional sports-car look with modern display technology. BMW's iDrive has its own high-definition 10.2-inch wide screen at the center of the dash. Outside, adaptive LED headlamps are standard as are LED accent rings for the parking lights, running lamps and directional indicators. Even base 640i models have rain-sensing wipers, heated side mirrors, Dakota leather upholstery, three-stage heated seats, power front seats with driver memory settings, dynamic cruise control, automatic climate control, Comfort Access keyless entry, a rearview camera system and Park Distance Control. The standard sound system in 640i and 650i models has nine speakers, with HD Radio and auxiliary inputs, while the premium system upgrades the stereo to a Harman/Kardon unit. With the Luxury Seating Package, front ventilated seats are added as well as a so-called "active fatigue reduction system." Other noteworthy options include a BMW Night Vision system with pedestrian recognition, a Heads-Up Display that projects information onto the windshield, and a Top View camera system with Side View, to help see the area around the vehicle when parking or maneuvering in very tight spaces at low speed. A Driver Assistance Package brings a host of active-safety features, including Automatic High Beams, Lane Departure Warning, Active Blind Spot Detection, the camera system, a Parking Assistant and the HUD feature. The BMW 6-series remains essentially unchanged for the 2018 model year. The coupe has been dropped leaving behind only the Gran Coupe sedan and Convertible. The M-Sport package now adds carbon-fiber trim from the M6 while 20-inch bi-color M wheels are also now available. The 2018 BMW 6-Series continues BMW's tradition of high-speed grand-touring models by laying down the fundamentals in a capable-handling convertible or 4-door Gran Coupe model, then offering a long list of high-tech enhancements that can improve performance. 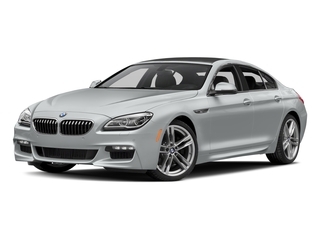 Meanwhile, the Gran Coupe is an unusual offering, with the sleek roofline of a coupe and all the performance of the 2-door 6-Series models, complemented by four doors and enough rear-seat space for adults. M6 models continue to stun with their over-the-top performance and a dynamic personality that can be dialed in with various settings for all of its electronic controls.